1:30 – 1:45 The Brown Scapular – Garment from Heaven – our protection for body and soul. 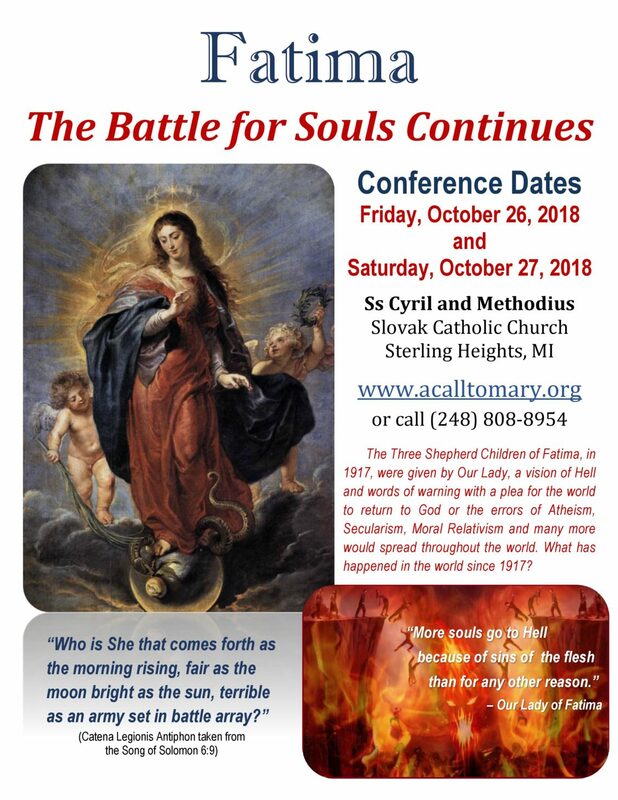 A CALL TO MARY – is an organization of Lay Catholics, faithful to Holy Mother Church, obedient to the magisterium and devoted to the Mother of God under the title of Our Lady of Fatima. It is dedicated to spreading the Message of Fatima and the teachings of the Church to the faithful through the media of conferences, computer technology and other means of public communication as directed by Holy Mother Church. It was founded for the purpose of returning to the Message of Fatima, recalling its prophetic warnings for the world and responding to the remedy given to us by Our Lady for the evils and the dangers that threaten our homes, our families, and all of humanity today.